Dr. Shreekant B. Mirajkar M.D. (Hom) a leading Homoeopath of Bijapur city Karnataka state. He has served as a lecturer at Al-Amaan Homoeopathic Medical College Bijapur. He is a social worker and dedicated for the development of Homoeopathy. He conducted many free medical camps and organized seminars. 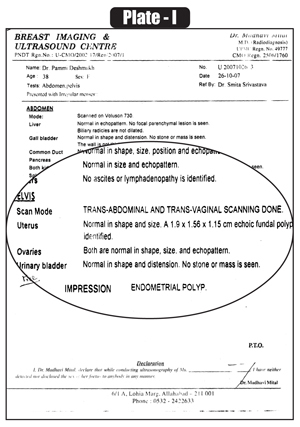 Here he presents a case of endometrial polyp. A female aged 38 years consulted me for irregular menstruation for the past 1 year. Initially she had periods for 7-8 days and later on 10 to 15 days with dark menstrual flow sometimes with clots. Menses once in 6 to 8 weeks. She is hypersensitive in nature. Complaints in general < from heat, desires spicyfood and aversion to salt and sweet. Thirst is reduced. Fear in general and wants company. 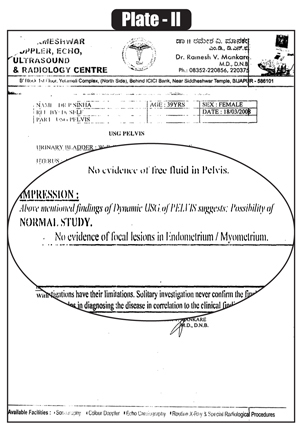 After analyzing the case with reference to Kents Repertory, Lycopodium is selected. Got menstrual cycle at regular time with normal bleeding. Carconosin 1 M – 1 Dose followed by Saclac for 1 month.